Good Breeze Kiteboarding has been giving kiteboarding lessons at the 520 Slick (aka “The Slick”) as early as 2008. 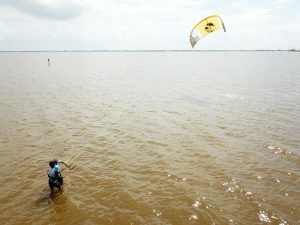 In the beginning days, there were only a handful of people kiteboarding there. Over the many years and even more lessons, the spot has gained a great deal of fame. 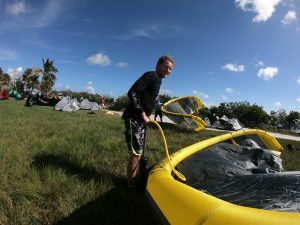 The perfectly flat “slick” conditions that occur during a North wind have put this spot on the map as a top destination for kiteboarders from all over. The official name of the park is Bicentennial Park. The waterway is part of the Banana River Lagoon between Cocoa Beach and Merritt Island. The 520 Causeway blocks the chop from the north wind allowing riders to glide and fly over perfectly flat water. Hugging the causeway and the mangroves that lines it allows amazing conditions. One of the quirks of this spot is that the best conditions occur in off-shore (relative to the launch shoreline) winds. Normally kiteboarders avoid offshore wind. This direction can push you away from the shore. The water surrounding the 520 Slick is fairly shallow in most areas. This makes for a safer riding area in almost any wind direction. There are channel markers which kiteboarders must watch out for. They mark the deeper channel for the boats. If in doubt, contact us. 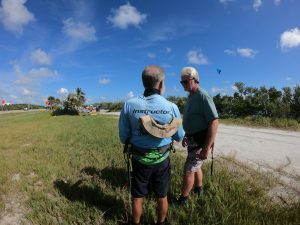 We offer lessons and supervision for kiters of all levels. The main safety concerns here would be stingrays that hang out on the bottom, sharp shells or oysters, channel markers and gusty conditions. Shuffling your feet as you walk and wearing protective booties will help combat the first two concerns. Being proficient with the kite and being aware of your surroundings/conditions will combat the next. The wind comes over mangroves and trees. This can cause somewhat gusty conditions so it’s better to ride with your kite high. Make sure to mind the right of way rules and respect riders entering and exiting the water. With the ever growing popularity of the 520 Slick, it is important that we keep the spot safe and fun. Feel free to check with us if you have any questions or concerns.